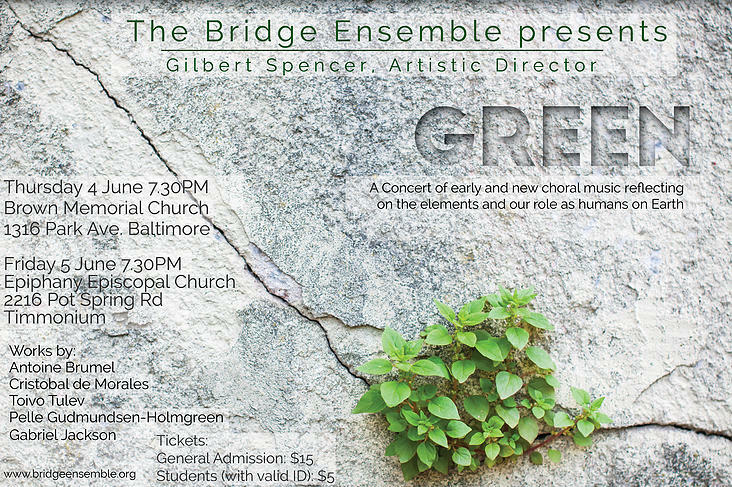 The Bridge Ensemble's second concert of its inaugural season, Green features vocal chamber music with texts about rain, wind, and the living earth. Green is an exploration of how the natural world informs our daily existence and the power of our living surroundings, including those threatened in our immediate home of Baltimore. 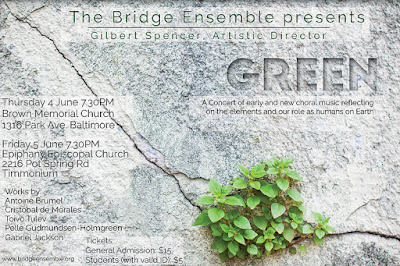 The Bridge Ensemble is a Baltimore-based professional chamber choir dedicated to exploring the links, both textual and musical, between pre-17th century choral music and new music of the late 20th and 21st centuries. The ensemble is 16 voices "bridging" this gap of several centuries, and aims to create innovative and engaging programs that will push the boundaries of what a performance can be in the 21st century. The group works to meld sound and spirit into one singular voice, speaking with us all, closely, rather than at us from a distance. Beyond this, the ensemble is full of love for its native city of Baltimore with its wholly unique people and culture, and hopes to mirror the creative spirit embodied by so many facets of its surroundings. The ensemble engages closely with emerging and local composers, performs in both traditional and new spaces, and strives to present the world's oldest musical traditions in innovative ways that resonate with its local conscience.